Elmer J. Fudd is a fictional cartoon character in the Warner Bros. Looney Tunes/Merrie Melodies series, and an adversary of Bugs Bunny. He has one of the more disputed origins in the Warner Bros. cartoon pantheon (second only to Bugs himself). His aim is to hunt Bugs, but he usually ends up seriously injuring himself and other antagonizing characters. He speaks in an unusual way, replacing his Rs and Ls with Ws, so he always refers to Bugs Bunny as a "scwewy wabbit". Elmer's signature catchphrase is, "Shhh. Be vewy vewy quiet, I'm hunting wabbits", as well as his trademark laughter. The best known Elmer Fudd cartoons include Chuck Jones' masterpiece What's Opera, Doc? (one of the few times Fudd bested Bugs, though he felt bad about it), the Rossini parody Rabbit of Seville, and the "Hunting Trilogy" of "Rabbit Season/Duck Season" shorts (Rabbit Fire, Rabbit Seasoning, and Duck! Rabbit, Duck!) with Fudd, Bugs Bunny, and Daffy Duck. An earlier character named Egghead set some of Elmer's aspects before the character's more conspicuous features were set. "Egghead" as he appeared in 1939's A Day at the Zoo. Tex Avery introduced a new character in his cartoon short Egghead Rides Again, released July 17, 1937. Egghead initially was depicted as having a bulbous nose, funny/eccentric clothing, a voice like Joe Penner (provided either by radio mimic Danny Webb or actor Cliff Nazarro) and an egg-shaped head. Many cartoon historians believe that Egghead evolved into Elmer over a period of a couple of years. However, animation historian Michael Barrier asserts, "The Egghead-Elmer story is actually a little messy, my sense being that most of the people involved, whether they were making the films or publicizing them, not only had trouble telling the characters apart but had no idea why they should bother trying." Egghead made his second appearance in 1937's Little Red Walking Hood and then in 1938 teamed with Warner Bros.' newest cartoon star Daffy Duck in Daffy Duck & Egghead. Egghead continued to make appearances in the Warner cartoons in 1938, such as in The Isle of Pingo Pongo and A-Lad-In Bagdad. In A Feud There Was (1938), Egghead made his entrance riding a motor scooter with the words "Elmer Fudd, Peacemaker" displayed on the side, the first onscreen use of that name. Egghead shifts from having a Moe Howard haircut to being bald, and wears a brown derby, a baggy suit, and a high-collared shirt. Egghead returned decades later in the compilation film Daffy Duck's Quackbusters. More recently, he also made a cameo appearance at the end of Looney Tunes: Back in Action and was also given in his own story, which starred him alongside Pete Puma, in the Looney Tunes comic book. One animation history suggests that the Egghead character was based on Ripley's Believe It or Not! cartoonist and entertainer Robert Ripley, while the name Elmer Fudd might have been a reference to the then-popular hunter Elmer Keith. Egghead has the distinction of being the first recurring character created for Leon Schlesinger's Merrie Melodies series (to be followed by such characters as Sniffles, Inki, and even Bugs Bunny), which had previously contained only one-shot characters, although during the Harman-Ising era, Foxy, Goopy Geer, and Piggy each appeared in a few Merrie Melodies. One of Egghead's final appearances is A Day at the Zoo, which ends with Egghead being swallowed by a lion he had been taunting. Whether intentional or coincidental, this was the end for the Egghead character. In the 1939 cartoon Dangerous Dan McFoo, a new voice actor, Arthur Q. Bryan, was hired to provide the voice of the hero dog character. It was in this cartoon that the popular "milk-sop" voice of Elmer Fudd was created. 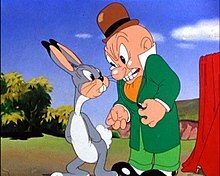 Elmer Fudd has since been the chief antagonistic force in the majority of the Bugs Bunny cartoons, initiating one of the most famous rivalries in the history of American cinema. Barrier notes, "Elmer Fudd was not a modified version of his fellow Warner Bros. character Egghead" and that "the two characters were always distinct. That was evidenced ... by Elmer's being identified in a Warner publicity sheet for Cinderella Meets Fella (filed with the Library of Congress as a copyright description) as 'Egghead's brother.'" Elmer Fudd, resembling Egghead early in his career, is annoyed by a rabbit in Elmer's Candid Camera. In 1940, Egghead–Elmer's appearance was refined, giving him a chin and a less bulbous nose (although still wearing Egghead's clothing) and Arthur Q. Bryan's "Dan McFoo" voice in what most people consider Elmer Fudd's first true appearance: a Chuck Jones short entitled Elmer's Candid Camera. The rabbit drives Elmer insane. Later that year, he appeared in Friz Freleng's Confederate Honey (where he's called Ned Cutler) and The Hardship of Miles Standish where his voice and Egghead-like appearance were still the same. Jones would use this Elmer one more time, in 1941's Elmer's Pet Rabbit; its other title character is labeled as Bugs Bunny, but is also identical to his counterpart in Camera. In the interim, the two starred in A Wild Hare. Bugs appears with a carrot, New York accent, and "What's Up, Doc?" catchphrase all in place for the first time, although the voice and physique are as yet somewhat off. Elmer has a better voice, a trimmer figure (designed by Robert Givens, which would be reused soon later in Jones' Good Night Elmer, this time without a red nose) and his familiar hunting clothes. He is much more recognizable as the Elmer Fudd of later cartoons than Bugs is here. In his earliest appearances, Elmer actually "wikes wabbits", either attempting to take photos of Bugs, or adopting Bugs as his pet. The rascally rabbit has the poor Fudd so perplexed that there is little wonder as to why Elmer would become a hunter and in some cases actually proclaim, "I hate wittle gway wabbits!" after pumping buckshot down a rabbit hole. Elmer in Rabbit Fire (1951). One episode where Bugs "lost" in the hunting was Hare Brush (1956). Here, Elmer has been committed to an insane asylum because he believes he is a rabbit (though it is also revealed that he is a millionaire and owns a mansion and a yacht). Bugs Bunny enters Fudd's room and Elmer bribes him with carrots, then leaves the way the real rabbit entered. Bugs acts surprisingly (for him) naïve, assuming Elmer just wanted to go outside for a while. Elmer's psychiatrist arrives, and thinking Fudd's delusion has affected his appearance, drugs Bugs and conditions him into believing that he is Elmer Fudd 'after which Bugs starts wearing hunting clothes and acting like Elmer, hunting the rabbit-costumed Fudd, who is in turn acting like Bugs. Their hunt is cut short when Bugs is arrested by a government agent as Elmer Fudd is wanted for tax evasion. After Bugs is hauled away trying to explain that the rabbit is Elmer Fudd, Fudd breaks the fourth wall and tells the audience "I may be a scwewy wabbit, but I'm not going to Alcatwaz" as he hops away as if he had planned the whole thing. This time period also saw a temporary change in Elmer's relationship with Bugs Bunny. Instead of being the hunter, Elmer was the victim of unprovoked pestering by Bugs. In Wabbit Twouble, Bugs plays a number of gags on Elmer, advising the audience, "I do dis kind o' stuff to him all t'wough da picture!" (A line somewhat ironically would later be said by Cecil Turtle as he and his friends cheat Bugs out of winning a race). Another short, The Wacky Wabbit, finds Elmer focused on prospecting for gold which would be used to fund the World War II effort. Elmer sings a variation of the old prospector's tune "Oh! Susanna" made just for this cartoon (complete with the phrase "V for Victory"), with Bugs joining in just before starting to hassle Elmer. He made a later appearance in an episode of The Sylvester and Tweety Mysteries as a Russian version with a simple name "Boris" who owns another comedy club in Russia. He nearly always vocalised consonants [r] and [l], pronouncing them as [w] instead (a trait that also characterized Tweety Bird) when he would talk in his slightly raspy voice. This trait was prevalent in the Elmer's Candid Camera and Elmer's Pet Rabbit cartoons, where the writers would give him exaggerated lines such as, "My, that weawwy was a dewicious weg of wamb." to further exaggerate his qualities as a harmless nebbish. That characteristic seemed to fit his somewhat timid and childlike persona. And it worked. The writers often gave him lines filled with those letters, such as doing Shakespeare's Romeo as "What wight thwough yonduh window bweaks!" or Wagner's Ride of the Valkyries as "Kiww the wabbit, kiww the wabbit, kiww the wabbit...!" or "The Beautifuw Bwue Danube, by Johann Stwauss", Stage Door Cartoon's line "Oh, you dubbuh-cwossing wabbit! You tweachewous miscweant!" or the name of actress "Owivia deHaviwwand". Part of the joke is that Elmer is presumably incapable of pronouncing his own first name correctly. Occasionally Elmer would properly pronounce an "r" or "l" sound, depending on whether or not it was vital for the audience to understand what the word was. (For example, in 1944's The Old Grey Hare, he clearly pronounces the "r" in the word "picture".) Usually, Elmer mispronounces the "r" and "l" by substituting the sound of "w". Fudd also appeared on The Sylvester and Tweety Mysteries in the first-season episode A Ticket to Crime as detective Sam Fudd; at the end he took off his clothes and turned into Elmer. Elmer appears as part of the TuneSquad team in Space Jam. In one part of the game he and Yosemite Sam shoot down the teeth of one of the Monstars dressed in black suits while Misirlou is heard in the background. Elmer took on a more villainous role in Looney Tunes: Back in Action, in which he is a secret agent for the Acme Corporation. In his scene, Elmer chases Bugs and Daffy through the paintings in the Louvre museum, taking on the different art styles as they do so. At the end, Elmer forgets to change back to his normal style after jumping out of the pointillist painting Sunday Afternoon on the Island of La Grande Jatte by Georges Seurat, allowing Bugs to easily disintegrate Elmer by blowing a fan at him. In Loonatics Unleashed, his descendant, Electro J. Fudd, tried to prove himself the universe's greatest hunter by capturing Ace Bunny, but settled for Danger Duck instead. Elmer himself also makes an appearance in the form of a photo which shows he presumably died at the hands of a giant squirrel. 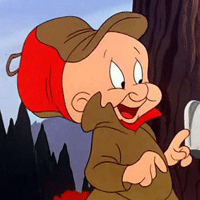 Elmer Fudd appears in The Looney Tunes Show voiced by Billy West. Portrayed as a wealthy businessman coming home after a hard day's work in the "Merrie Melodies" part of the episode "Best Friends," he sings about his love of "gwiwwed cheese" sandwiches. He later had a brief cameo appearance in "Fish and Visitors" as a weather forecaster briefly exclaiming about the rainy weather and doing his famous chuckle at the end. In "Working Duck," Elmer Fudd appeared as a newsman where he reports that Daffy Duck was fired from his position as a security guard after falling asleep during a nighttime bank robbery where $10,000,000.00 were stolen. Later on, Elmer Fudd reports that EnormoCorp went out of business due to the worst business decision in the history of business decisions caused by its CEO Daffy Duck (who succeeded the previous CEO Foghorn Leghorn who retired) where he went with the "Proceed as Planned" choice instead of the "Delay the Merger" choice when he mistook Pete Puma as the new muffin man. As a result of this, Elmer mentioned that 10,000 of its workers are now out of a job and states that experts fear that the world economy could collapse. Elmer also states that disgraced CEO Daffy Duck could not be reached for a comment. In "A Christmas Carol," Elmer Fudd reports on Foghorn Leghorn's plans to end the heat wave on Christmas. Elmer Fudd later joins the other characters in the Christmas song called "Christmas Rules" at the end of the episode. In "Dear John," Elmer Fudd reports on Daffy Duck winning a spot on the city council. Elmer Fudd later reports on Daffy Duck's apparent death where he supposedly lost control of his parade float and drove into the St. Bastian River. In "The Black Widow," Elmer Fudd reports on the theft of the Hillhurst Diamond from the museum caused by someone called "The Black Widow." On June 8, 2011, Elmer starred in the 3-D short "Daffy's Rhapsody" with Daffy Duck. That short was going to precede the film Happy Feet Two, but was instead shown with Journey 2: The Mysterious Island. Elmer Fudd appears in Looney Tunes: Rabbits Run voiced again by Billy West. He appears as a spy working for the Mexican general Foghorn Leghorn. In the 2017 DC Comics/Looney Tunes crossover books, an alternate version of Elmer Fudd was created for a story in which the character was designed more for the DC Universe and was pitted against Batman in the Batman/Elmer Fudd Special. In the story, Elmer is a bounty hunter that originated from the country side before he moved to Gotham to make ends meet. He considered putting the shotgun away for good when he fell in love with Silver St. Cloud, but she was killed by hitman Bugs "The Bunny". He goes to a bar called Porky's (which has attendants that are humanoid versions of other famous Looney Tunes stars) to kill Bugs. Bugs confesses to killing Silver, but avoids death by telling Elmer that Bruce Wayne hired him to do it. Elmer believes Bugs as Bruce was Silver's former lover, and shoots Bruce at a party for vengeance. Batman confronts Elmer in his apartment and defeats the gunman in a fight, where Elmer tells Batman about Silver's death and Bugs. Elmer and Batman return to Porky's and take out most of the crowd before confronting Bugs. The three are shocked to find Silver in the bar herself, where she revealed that she left Bruce and Elmer because of their dangerous lifestyles and had Bugs fake her death. The story ends with all three of the men requesting a glass of carrot juice from Porky. In the issue's backup story, Bugs, Elmer, and Batman re-enact the famous "Rabbit Season, Duck Season" sketch with Batman replacing Daffy as Bugs tells Elmer it's "Bat Season". After getting shot by Elmer too many times, Batman takes Bugs' advice and makes it Robin season, causing Elmer to pursue the Dark Knight's sidekicks instead. Fudd was originally voiced by radio actor Arthur Q. Bryan, but three times in Bryan's lifetime the voice was provided by the versatile Mel Blanc: in To Duck or Not to Duck, Blanc spoke as Fudd saying "that one", in The Scarlet Pumpernickel (1950), only a single line was needed, and bringing in Bryan was not cost effective, and in What's Opera, Doc?, Elmer's furious scream "SMOG!" was dubbed by Mel Blanc, although Bryan had voiced the rest of the part. Later, during the musician's union strike of 1958, another artist did the voice for Elmer's co-starring appearance in Pre-Hysterical Hare. There is no documented reason for Bryan's absence, leaving some fans to speculate that he refused to cross the picket lines. Blanc would take on the role regularly in the 1970s and 1980s, supplying Elmer's voice for new footage in compilation feature films and similar TV specials, as well as some all-new specials. He admitted in his autobiography that he found the voice difficult to get "right", never quite making it his own. In Speechless, the famous lithograph issued following Blanc's death, Elmer is not shown among the characters bowing their heads in tribute to Blanc. ^ a b c d Elmer Fudd at Don Markstein's Toonopedia. Archived from the original on June 16, 2016. ^ a b Egghead at Don Markstein's Toonopedia. Archived from the original on June 16, 2016. ^ Kress, Earl. "Great Scott!". MyNameIsEarlKress.com. Archived from the original on November 30, 2006. Retrieved April 9, 2015. As per Keith Scott, who gave Webb's birth name of Dave Webber, and Mark Evanier, who gave it as "Dave Weber". ^ a b Barrier, Michael (June 25, 2009). "Summer Slumber". MichaelBarrier.com. Retrieved February 3, 2013. ^ Thompson, Neal (April 29, 2013). "Believe Them or Not! Six 'True' Stories About Robert Ripley". Biographile.com. Retrieved April 9, 2015. ^ Warner Bros. Rabbit Fire. Elmer: I'm a vegetawian. I onwwy hunt for the sport. ^ "More 3D Looney Tunes Shorts On The Way". ComingSoon.net. June 8, 2011. Retrieved February 15, 2012.